Richard Nisbett, who I have mentioned here before, has written a brief but interesting article about the fundamental attribution error.Together with Lee Ross, he once wrote a classical book about this, The Person and the Situation. The fundamental attribution error means that we systematically underestimate the influence of situations, structures, and systems on our behavior en systematically overestimate the influence of personal traits and dispositions on our behavior. As Nisbett says it: we are, wrongly, inclined to think about human behavior in purely dispositional terms. Nisbett writes that non-Westerners are less vulnerable to the fundamental attribution error. He thinks this is due to the great influence which Aristotle has had on Western culture. Artistotle had a strongly dispositional view of behavior of humans and also of objects. For example, he thought that a stone sinks in water because of property of the stone while other object which do not sink lack that property. The findamental attribution error has many consequences. When we see someone do something dishonest we tend to look for the cause of this behavior within the person ("What a dishonest guy!") We think that we never do such a thing. But, as Nisbett explains, human behavior varies a lot over different situations. The influence of intrapersonal factors is much smaller than we think. What we realize too little is that if someone behaves honestly in one situation, he might not in a very different situation. This also explains why people tend to attribute excellent performance to talent (in the sense of natural ability). That the excellent performer has invested tens of thousands of hours in the development of his skill is not what we see and mention. No, the explanation must be natural ability. This is an example of how we tend to search for explanations within the person not in the interaction between the person and his situation. And this is incorrect. 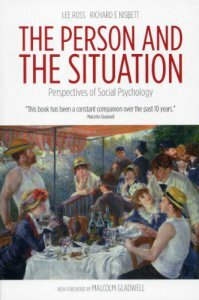 One reason why we underestimate the variability of human behavior over situations is that normally we do not experience people in a wide variety of situations. We usually see them in one type of situations, for example in their occupational role or each year at the same birthday party. When we become more aware of the fundamental attribution error we might correct for it. This may help us think more mildly about people who show behavior we disprove of. We realize that the behavior not only reflects the person but also, to a large degree, the situation which the person is in. We realize that we might show the same behavior ourselves if we would find ourselve in their situation. Another advantage of realizing that we tend to overestimate the role of traits and talent is that this may make it easier to believe in the malleability of behavior. We can acknowledge and utilize the power of situations. An important wat to change our own and other people's behavior is to change situations. In a different type of situation it becomes easier for us to behave differently.